Naming conventions » Mazda 323 C ? 323 P ? Mazda 323 C ? 323 P ? 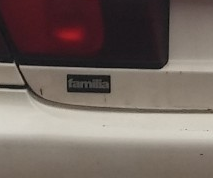 As a Mazda 323 F owner, this is something that has puzzled me for a while. Where I live (Belgium), the 1994-98 323 range was just called "323", except for the 323 F, which was based on a different platform. But, sometime around 2013, I noticed several Wikipedia articles starting to mention european versions as called 323 C, S and P. I'd never heard of those designations before, and they weren't used in either Belgium or France. Does anyone know in which country/countries were they actually called like that ? And maybe have have some reference (brochures, press pics) to prove it ? Because on the Wiki articles, the photo links for the "C" and "P" show cars without any "C" or "P" badges. So there's no actual proof. I have the suspiscion that those "european" names were specific to a country, and because those Mazdas don't have the same following as, say, the Impreza, anyone could write anything about them on Wikipedia and no one would bother to check the veracity. It was the same in the UK. Though I'm not sure how the little 3dr coupe one (323C/Neo) was called. The odd one here was the next one (only sold as a fastback/wagon). Brochures called it 323 but the badge on the back said '323F'. 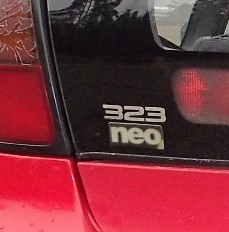 Ah yes, the next generation of the 323, with a regular hatchback. I guess they called it 323F to try to capitalise on the success of the previous one. Still, can anyone prove the authenticity of these C, S & P designations ? From what I can gather, it seems like the C, S and P designations were not officially used to market the cars, but were some kind of internal designations for the different body styles, while the F was badged as such. 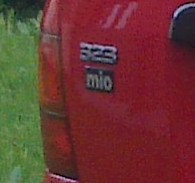 The previous and following generations were both badged as 323 or 323F depending on the model. I wonder what the rationalisation behind choosing these names was. Interesting piece of information ! 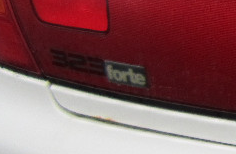 The "forte" badge clearly hides the original "F". 627 days later, I've had a eureka moment. As far as I know, the first mentions of Mazda 323 S, C & P appeared on the german language Wikipedia. And how do you say fastback in German ? How do you say sedan in German ? So I thought they could be specific names for the german market, and it turns out that's the case ! So, "made for D" then. I've updated the entries (and dropped C's and P's from a few non-german cars).